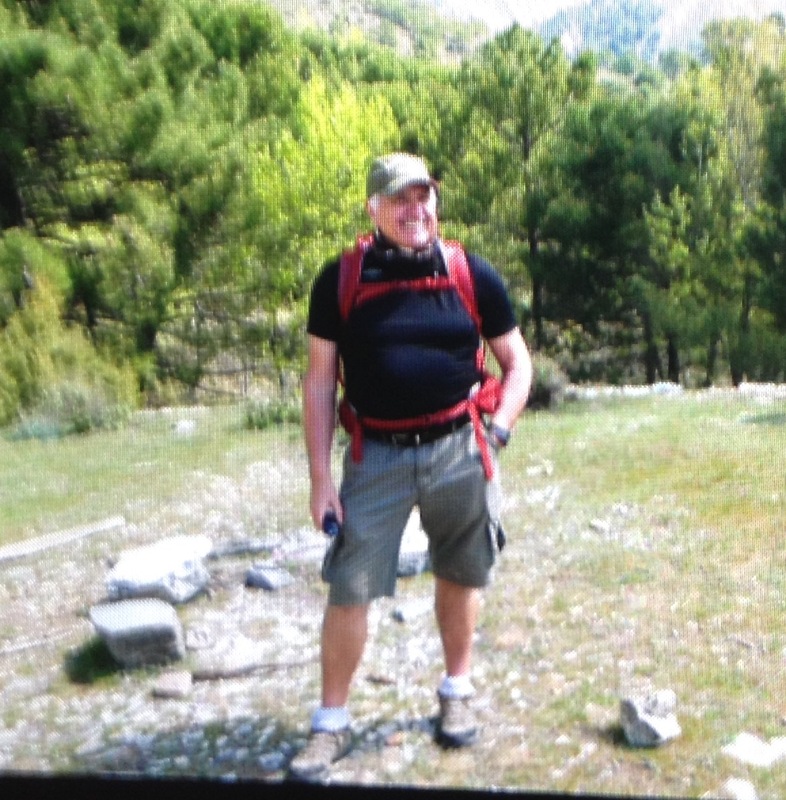 Our final day Walking in Competa organised by Ramblers Uk. 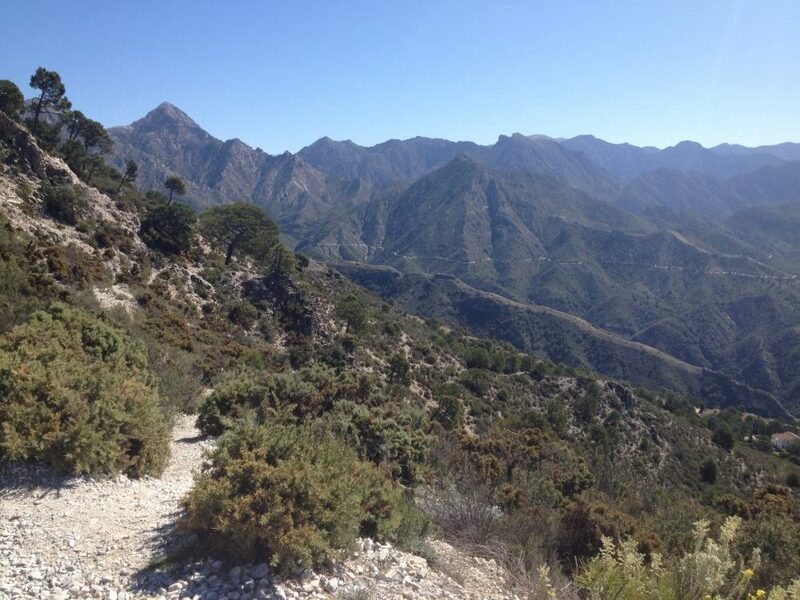 Today’s objective is a high ridge route from Fabrica de la Luz about 7 km from Competa. The route takes us up through a lovely gorge in the morning sunshine. The target for the first part is Pureto Blanquillo. The initial track is narrow crossing the steam a couple of times before opening out from the undergrowth to narrow rocky track up to the col.
We reached here about 12 noon. A short decending walk to our lunch stop of Venta Pradillos an old settlement but a welcome break as we had been on the go since 09-15. We began our decent back to Puerto De Colado after lunch and were afforded excellent views of the surrounding region which is stunning everywhere you looked. Finally arrived back to Competa for a little refreshment with the Ramblers Crew a well earned drink for the good company of 19 different persons coming together just 7 days ago. A real band of brothers/sisters. Thanks to each for their company. Heart 37 min peak, 4 hrs 19 mins cardio, 4 hrs 49 min Fat burn. 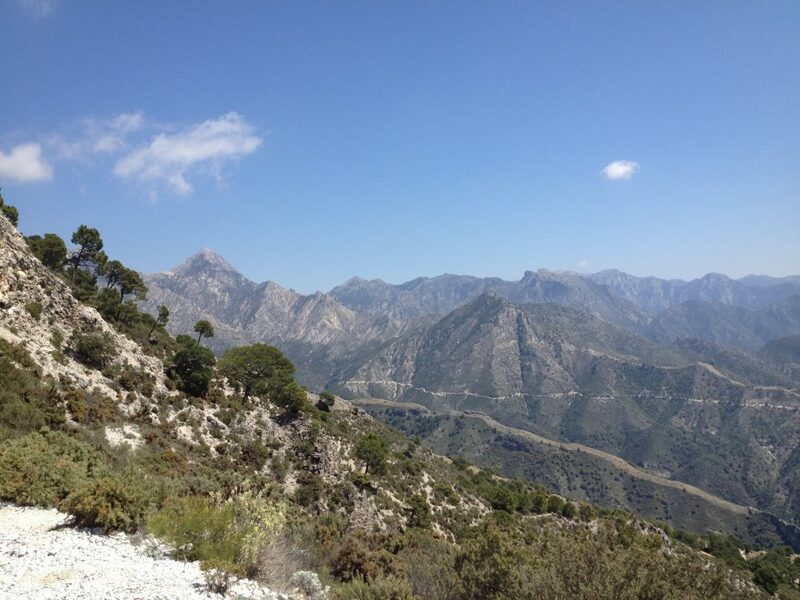 Objective today is an undulating walk from just outside Competa to Frigiliana approx 17 km. Coolest day so far but no rain. 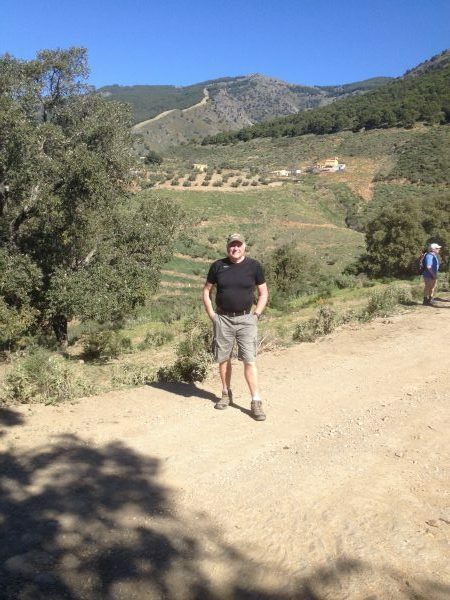 Walk from outside Competa to a lovely small village called Acebuchal. Stopped here @ 11 am. Had a large slice of carrot cake cream and coffee. Onwards then to the town of Frigiliana. Bus back to Competa. 15km today build up to the ridge walk. 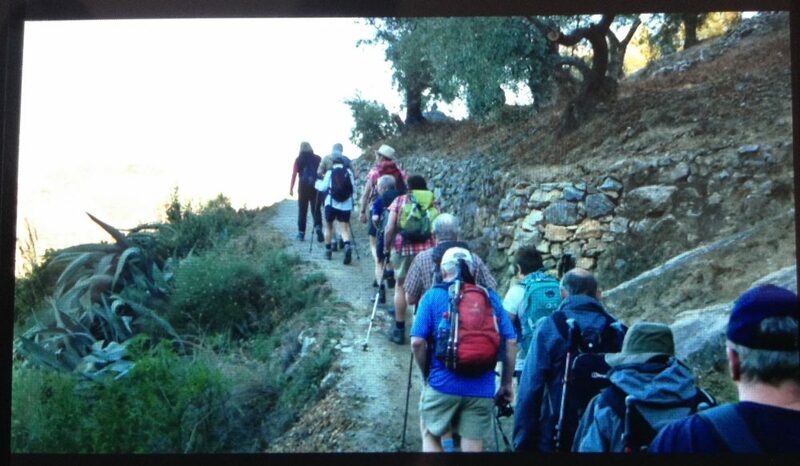 The route was a very pleasant walk along the forest tracks, for the first time this week there were a lot of motor traffic making their way to Acebuchal and the town of Frigiliana. We had two hours to take our lunch and explore. Steps 20804, Distance 15.82 km, 127 floors. This our rest day boy do we need RR. Most days on the hoof of around 6 hrs OK we did have some long stops for the odd refreshment. A large group went by local bus down to the coast but I decided I needed as much rest as possible. 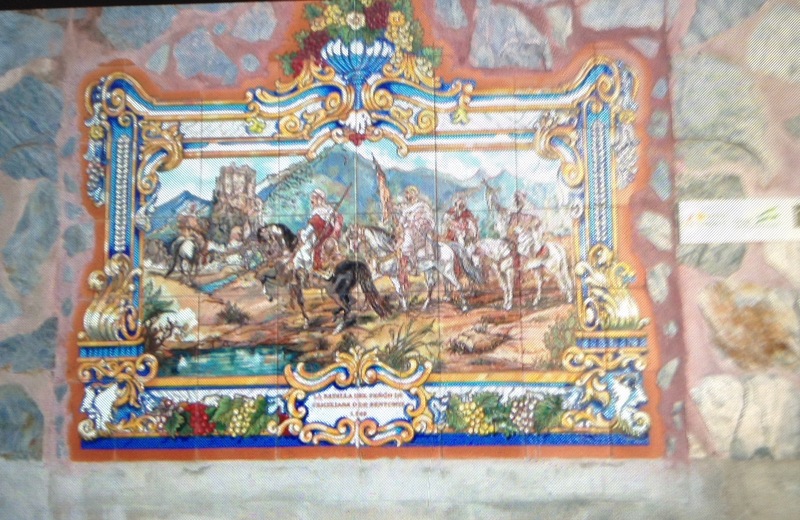 After getting map etc from tourist office decided to look out the 15 mosaics dotted around the town. Will add further when I get home. Steps 11709, 8.9 km, 67 floors. Heart 12 peak, 1 hr 41 mins cardio, 10 hrs 32 min fat burn. Dinner taken outside when suitable if the wind does not get up. 19 round the table brilliant company. The wine is quite good too. Some stats from Fitbit for each day. This was the view on our first stop at Puerto del Collado. A steep initial climb out of Competa and a steady track winding round the hillside to this view point. A fabulous vista we had after only about 1.5 hrs walking. A good rest here for photos and a discussion of where next. off we set before turning off up hill along a narrow track for some 200/300 m climbing, quite tough going till we reached the col. Mini lunch break taken here time about 1145. Set off again some went to the fire watch tower and the rest caught with the party a little way down the track. Destination was Canillas de Albaida, mostly fire and forestry roads from here on – lunch break taken around 1300 en-route. 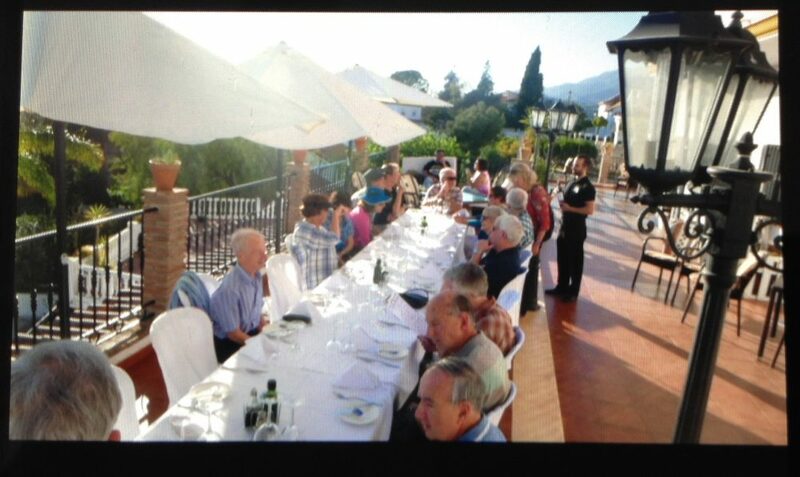 Eventually arrive at Canillas and just a wee drink was taken before returning to Competa. The crew are in their way. Well I am always up for something new. Decided to try a walking holiday with Ramblers UK and plumbed for this one week in northern Spain with a group of unknown people – a dip into the unknown. Arr here April 1 after joining up with group at Malaga Airport. Flight from Glasgow was with Jet2.com leaving at 06-50. Group assembly was made with fellow Ramblers UK clients and guide Ursula. The group members came from London, Manchester and Canadians. A journey by coach of about 1.5 hrs up into the Axarquia district from Malaga got everyone introducing themselves to within the group of 19 persons. Ursula the guide gave us an update of the surrounding area and what was to happen in the evening before dinner. 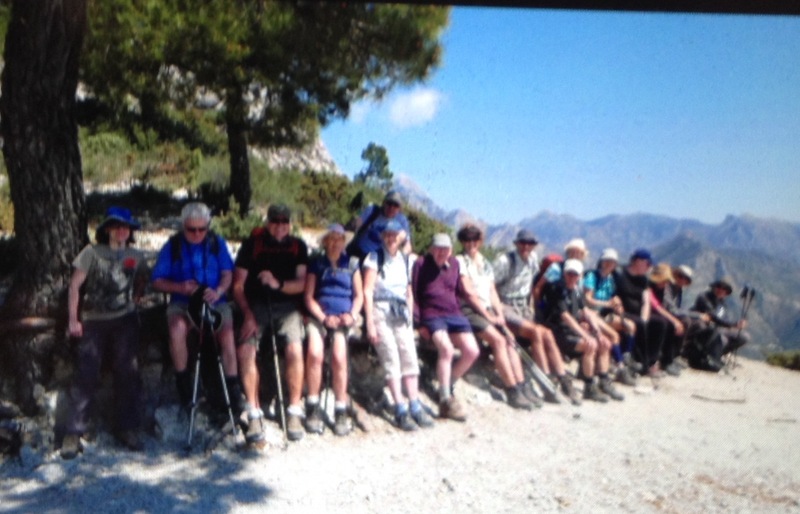 After checkin and a short rest it was off to do a check of the town of Competa with Ursula and the group. Back to hotel Balcon de Competa for our nightly debrief for the day ahead. Full instructions of the week ahead and the task/objective for tomorrow April 2. Day one local circular walk via Canallis. Day two up via Peuteo Collobro and then upwards before descending back into Canallis. Day three short taxi ride to begin route around to Arabic town of Salares. Day four was a rest day. Day five a route to Frigiliana about 17km. Day six a high local ridge route. There will be spelling errors and photos to add at a later date. After reading I will update as and when possible.